It wasn't the type of gift you would normally think of for an 84-year-old Pope best known for conservative theology and critiques of secular culture. And indeed, as Benedict XVI moved through the exhibition of contemporary art that had been installed in his honor  one work for each of the 60 years he has been a priest  there were times when he looked more than a little bemused: pausing, say, in front of a flat blue canvas broken by a raised geometric pattern, or staring up at a metal etching of a face with a thin tree branch sprouting from between its eyes. 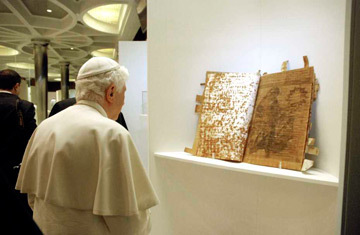 And yet, the Pope was clearly pleased with the project  the first incarnation of an effort he has championed to reconnect the Catholic Church with the world of art. It was a realm the Vatican once dominated, but one in which it has had little presence for more than a century. "Make the truth shine in your works  never separate artistic creation from truth and charity," Benedict urged the assembled artists, who had joined him at the show's opening in Rome in early July. They ranged from Ghanaian sculptor El Anatsui to American painter Max Cole. The Vatican's undertaking is by any measure ambitious. The modern church's influence in the world of art is all but non-existent  a far cry from the time when the Pope could commission Michelangelo to paint the ceiling of the papal chapel or when Cardinals could call upon Caravaggio to ornament the churches of Rome. Depending on who is talking, it's been at least a century  and maybe a couple more  since the Vatican was an important patron of the arts. Certainly, in the 20th century, the schism between the two worlds yawned larger than ever. Popular culture swerved toward the secular, modern art fled sacred spaces for the world of galleries, foyers and museums, and the church retreated into tradition. There's little question that church grandees, left to their own devices, would prefer to tread the safe ground of figurative religious art. But there's also a recognition that if the Vatican is to reassert itself among the artistic class, it will have to learn the vocabulary of modernity. "It's another language, something completely different," says Cardinal Gianfranco Ravasi, head of the Pontifical Council for Culture, who has been leading the effort. For the Pope's exhibition, "The Splendor of Truth, the Beauty of Charity," Ravasi and his assistants chose a broad theme and asked a selection of artists to contribute a new or previously completed piece. Benedict seemed drawn by those that made tentative steps toward common ground. He examined a score the Italian composer Ennio Morricone had drawn in the shape of a crucifix, and paused to speak with a young German photographer, Christoph Brech, who had contributed a series of photographs taken in the Vatican museum showing nested doors leading to a brightly lit wall. "He told me, 'Despite the wall, you are led toward the light,' " says Brech. However, even if the Pope and other church officials are willing to hold out their hands, persuading the art world to accept them won't be easy. After all, much has changed since the times when an artist's patron was a King, Emperor or Pope. Today's patrons are more likely found in the boardrooms of Moscow or Hong Kong than in the decaying palaces of Europe. Ravasi, knowing any effort by the Vatican will be greeted with suspicion  perhaps hostility  has proceeded with caution. The Vatican expressed interest in contributing a pavilion to the Venice Biennale in 2009 and '11, but then decided to aim for '13. "It takes some courage," concedes Paolo Baratta, president of the biannual event. "The choice to come to the Biennale is the choice of being within the waves of the world. It's saying, 'I want to be on a boat in the open ocean,' not 'I want to build a monument to the relationship between the church and contemporary art.' "
For the Holy See's eventual entrance into the Biennale, Ravasi would like to ratchet up the religion a step further than that conveyed in the exhibition for the Pope. He intends asking no more than 10 artists to draw their inspiration from the first 11 chapters of Genesis, which span the history of creation  from "Darkness upon the face of the deep" through the felling of the Tower of Babel. In Ravasi's view, contemporary artists have, with few exceptions, become severed from the spiritual themes that motivated their predecessors. "They've lost the great stories, the great narratives," he says. And yet, according to Ravasi, even blasphemous works like Andres Serrano's Piss Christ, or the Austrian artist Alfred Hrdlicka's depiction of the Last Supper as a gay bacchanal, are illustrations of the enduring power of transcendental and religious themes and their place in the world of art. "It shows they have the desire to come back to the big symbols," he says. For a church looking to reconnect with artists, that would be a gift indeed.